Tada! Please share and love love love! Judges, that is. Costume contest judges of all kinds. Those you drop your hard work and dedication in front of for scrutiny. Those judges. A friend prompted this post by asking about “unwritten” requirements in masquerades and cosplay contests. What are the expectations for each level? For presentations? For anything? First off, the written rules are the only ones you need to worry about. Those are designed by the coordinators or chairs in order to make things fair and – most importantly – keep you safe. They also remove any liability from the con if you choose to ignore those rules. Second… You’ll never know the unwritten requirements. You’ll never know what each individual judge really wants to see. You can’t know that stuff, all you can know is that you love what you did and you did good work. You might be able to learn them by looking at past winners and participating in the contest – but only maybe. Those unwritten expectations change from year to year, convention to convention, judge to judge. They’re always different, and that’s part of the fun! As an example, the question of wearing colored contacts came up. Lots of people love to wear them to complete a look. I do it on occasion too – and I’m in the market for some circle lenses soon! But is it necessary? As a judge, I like it because it’s a detail that’s been considered. It’s just like taking the time to choose the right colors or finish your seams. It means you put thought into it. But it’s only one piece in a thousand that indicate your skill and interest level – there are plenty of others to work with. It’s an extra: like adding a delicately sugar-frosted cherry on top of an already intricately decorated cupcake, but the lack thereof isn’t going to deduct points. When judging, I wouldn’t be looking for it – but if you did it (and pointed it out, as it’s not always obvious) with the intention of providing just that one more detail, I would love it. As a cosplayer, I love the look – especially if the character’s eyes are distinctive – and the way it can really complete a costume. I don’t regularly wear contacts, though, so it’s a challenge I reserve for distinctive costumes. OR sometimes it’s an added detail to a costume that’s otherwise rather simple: Princess Emeraude, for example. I wore blue contacts with her costume – a non-competition piece – because first of all she’s MADE OF EYES, and second because with her simple white shift, it was a detail that I felt really defined the costume. I love details; I’m a detail fiend. That’s how I choose to create costumes. … anything that makes you memorable. Give the judges a good reason to remember you and your costume, whatever that reason is. Make a statement, and make it yours. Enjoy! The as-yet-to-be-renewed Heroes of Cosplay completed its initial run tonight with some spectacular fun and serious drama (guys, it’s reality TV, there is drama. Did you know you have nerves attached to your muscles?). One of the most lovely moments was Jinyo’s proposal to Victoria. So sweet, and the opportunity to have help from such a fantastic gentleman as Peter Mayhew (THE Chewbacca) simply can’t be passed up. Peter is also currently in need of medical care which his friends, family, and fans are helping to support via the website Standing In The Stars. Unfortunately, a far more negative scene awaited us during the masquerade as the crowd jeered the “out-of-towners.” It is my understanding that there was some frustration with the show and management, but in my opinion, that is absolutely no reason to be heckling people, offering rudeness, or (even if you didn’t start it, as I have heard is the case) continuing an argument. What the hell was that? Aren’t we all adults? Aside from that, “out-of-towners?” REALLY? It’s a major convention that brought hundreds of thousands of people to Kansas City. Conventions are DESIGNED to be attended by non-residents. If there were only residents of that city attending THERE WOULDN’T BE A CONVENTION. And heaven forbid there were only locals in the masquerade – it’d be five minutes long with two entries and no judges. When you are costuming, you are there to do YOUR best. If your best doesn’t win you an award, keep going. Learn. Seek out new and better techniques, materials, keep creating and GROW. But do not stand there and cry in your beer that you were “outclassed.” Every single one of those people started out with no skills; they worked for them and built them. It is an extremely ungracious and disingenuous way to approach anything. You didn’t start it? Good for you. But you didn’t leave it, either. You participated in a meanspirited, abrasive heckling. You were hungry, tired, and hurting? So was everyone else in that masquerade. No excuses. Bullying and meanness is never okay. Period. Aside from that, it seems like it was a great experience for all the folks involved. There was a lot of growing, learning, and the requisite struggle that is one of the things that makes anything – but especially cosplay – worth doing. Looking forward to another season! Learn more at SyFy’s website. I love this episode, too! So much excitement and – yes indeed! – drama! One of my favorite things was the emphasis that Yaya put on the performance aspect of their competition entry. I love the idea of a big reveal for Riddle’s Alice/Meat dress. Watching Yaya move in their skit rehearsal really demonstrated her dedication to the theatrics of a skit like this. I’ve really been enjoying this aspect of cosplay coming out. 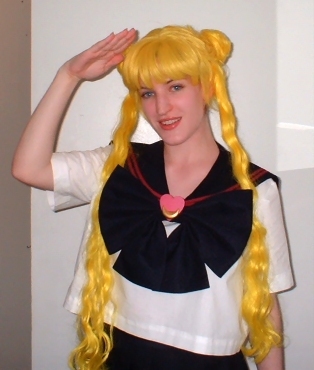 When I started, the first skit I did in 1999 was literally a bunch of people I’d met at the con that day in Sailormoon costumes and we were making it up as we were in line for the contest. I’m so delighted in the change to these well-written and planned out skits with music, voice, even special effects! That’s so exciting, and really just adds to much to what cosplay already is. Everyone also really seemed to be pulling out all the stops and trying something new. Building props with friends is some of the best cosplay-time I can remember, and I feel like Jessica, Holly & Rebecca really represented that. One of my own proudest moments in cosplay was made possible only by the huge effort of my friends Jake & Tom who built Nausicaa’s mehve glider for me. Seeing Chloe & Jesse find success with their costuming was heartwarming. Jesse, who had worked so hard, put so much expertise and effort into his truly professional-level costume, was really gratified by his award – a position I really understand. Though we persevere despite a lack of recognition or praise, there is a great feeling that comes from the accomplishment of getting an award. We can know we’re good, but outside recognition means something different. Maybe not better, but different. Also hello Jessica & Holly as Riker and Picard, I mean come on. It doesn’t get any better than that. I’ve been feeling a little bit lately like I’m out of the cosplay loop. Part of it is just that I WAS out of the loop… getting laid off and finishing grad school and being a first year elementary school teacher and a major 3 month illness will sort of do that to you. Oh, and getting married and buying a house with said new spouse, those things will all do it, too. All of that stuff happened to me in the last three or four years, taking away my attention from a community that’s been changing in major ways, right under my nose. I never really stopped cosplaying, but it did take a major back seat in my life for a while, and that’s left me reeling a little as I’ve come back to the scene full force. It’s been good in a lot of ways: I’ve grown in both skill and attitude. I’ve done more ‘traditional’ costuming, working from a number of different material sources (books, for instance). I’ve gone to more kinds of cons than just anime cons – I have to say that was a great experience, and I’m really fond of Costume-Con and the scifi-fantasy con scene. It took me until last year to get up a cosplay Facebook page. It seems like that really became the thing to do while I was on my not-really-a-hiatus, and I totally missed the boat. I was surprised to see it a point of contention that how many ‘likes’ you had was so important, as if it was a way to measure your worth as a cosplayer. Then again, it sort of didn’t surprise me at all. It was that way for years with photo comments at cosplay.com or comments and friends on Livejournal. A new method to old madness? Could be. The word ‘professional’ is bandied about quite frequently. There’s no hard and fast definition (because how can you have a hard and fast definition of any job in the arts?) but I love that people are making what they love into a career. That’s a dream so many have, and I’m impressed that people are pursuing it with such passion. My attitude is really different now. I think that had less to do with cosplay itself than with me learning more about who I am and what’s important to me… and while cosplay is definitely important, I think I have a better idea of, well, HOW. I learned a lot about my former bad attitudes – limiting others (at least in my head) by gatekeeping, keeping a list of what the criteria for “good” cosplay was, that sort of thing. I had my eyes opened to how damaging those ideas are really only within the past year, and I’m proud to have broken those incredibly destructive attitudes. Unfortunately, I still see it happening in the community, and I feel like teaching more positive attitudes is now a priority for me. I guess it’s a throwback to my chosen career, education, and how much I want our community to be strong and welcoming. Cosplay IS mainstream now, there’s no denying it. When Conan O’Brian uses the word regularly on his show, it’s mainstream. The definition of the word itself has changed in the last few years – cosplay is a synonym for costuming. There’s no difference now. Cosplay is nothing more than wearing a costume, whether you made it or bought it, whether it finds it’s source in Asian pop culture or American comics or English literature, whether it’s a customization or genderbend, whether the design is yours or someone else’s. It’s all cosplay. And it’s so beautiful. I take it back. I don’t feel out of touch – I feel inspired. I don’t feel old – I feel rejuvenated. I’m so proud to be part of a growing, learning community.